Euro Zone – CB Capital Research, Inc. In our earlier 2017 outlook on the U.S. 10-year Treasury yield published on December 21, 2016 (see “Our 2017 Outlook on U.S. Treasuries: 2.25% on the 10-Year“), we argued that the U.S. 10-year Treasury yield will close at around 2.25% at the end of 2017. Our target at the time was very much out-of-consensus, as most analysts (including those from Goldman Sachs, Morgan Stanley, and PIMCO) were expecting the 10-year to rise to 2.75% or above, driven mostly by late-cycle inflationary pressures and the promise of U.S. corporate tax cuts and a $1 trillion infrastructure spending package by the Trump administration. Since the publication of our 2017 outlook on the 10-year Treasury, U.S. economic growth has disappointed, with the “advance” estimate of U.S. Q1 2017 real GDP growth hitting an annual rate of just 0.7%. As a response, the U.S. 10-year yield sank to a trough of 2.18% on April 18, before rebounding to a close of 2.33% earlier tonight. Figure 1 below shows our timing calls as discussed in our weekly global macro newsletters on the U.S. 10-year from June 2015 to the present. Note that prices of the 10-year Treasury rise as yields decline. In our April 30, 2017 newsletter (email me for a copy), we switched from a “neutral” to a “bearish” positioning on German/French sovereign bonds, as: 1) after experiencing a near-Depression during the 2011-13 period, European economic growth was finally accelerating, and 2) ahead of the May 7th French run-off vote between Macron and Le Pen, it was clear that European political risk was dissipating. In fact, European forward rates at the time were showing a 60% chance of an ECB rate hike in March 2018. An acceleration in European economic growth is also being confirmed by the latest readings of our proprietary CBGDI (“CB Capital Global Diffusion Index”), as seen in Figure 2 below. I have previously discussed the construction and implication of the CBGDI’s readings in many of our weekly newsletters and blog entries. The last time I discussed the CBGDI on this blog was on May 12, 2016 (“Leading Indicators Suggest Further Upside in Global Risk Asset Prices“). To recap, the CBGDI is a global leading indicator which we construct by aggregating and equal-weighting the OECD-constructed leading indicators for 29 major countries, including non-OECD members such as China, Brazil, Turkey, India, Indonesia, and Russia. Moreover, the CBGDI has historically led the MSCI All-Country World Index and WTI crude oil prices since November 1989, when the Berlin Wall fell. Historically, the rate of change (i.e. 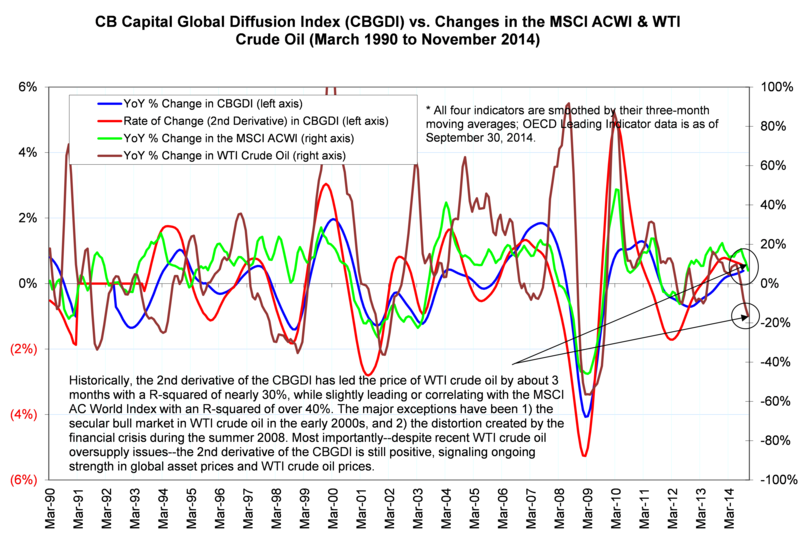 the 2nd derivative) of the CBGDI has led WTI crude oil prices by three months with an R-squared of 30%; and has led or correlated with the MSCI All-Country World Index, with an R-squared of over 40% (which is expected as local stock prices is typically a component of the OECD leading indicators). The latest reading of the CBGDI has continued to improve after making a trough in late 2015/early 2016 (see Figure 2 above). Both the 1st and the 2nd derivatives of the CBGDI have continued to climb and are still in (slight) uptrends, suggesting a stabilization and in many cases, an acceleration (e.g. the economies of Austria, Canada, Denmark, France, Germany, Norway, South Korea, New Zealand, Brazil, and Russia ) in global economic activity. With Chinese RMB and capital outflows having stabilized in recent months, global economic growth around the world seems to be synchronizing. This should lead to higher U.S./German/French sovereign rates from now till the end of 2017. As professional investors, we have been trained by the markets, the CFA Institute, and business school professors early on to avoid certain kinds of investments. Examples include scams such as Florida swampland (if it is too good to be true, it usually is) and obsolete businesses such as U.S. textile mills (by far Warren Buffett’s worst investment in his storied career) or newspapers & magazines whose revenues are still dependent on print advertising. As I previously pointed out, Italian banks, along with systemically-important Deutsche Bank, have the distinction of fitting into both categories. Deutsche Bank’s core investment banking & trading businesses are obsolete in the post-crisis, capital-constrained world (think Basel III, Basel IV, Solvency II, and IFRS9), and yet Deutsche’s leadership remains in denial. Meanwhile–as I pointed out in two earlier blog posts (“Strengthening the Global Banking System’s Weakest Link” published on April 12, 2016 & “Italy’s NPLs Still the Global Banking System’s Weakest Link” published on July 7, 2016)–Italian policymakers have for years refused to reform or even acknowledge the growing NPL problem within the Italian banking system. It wasn’t until this year that investors finally forced Italian policymakers and banks to act; more than 7 months into the year, they have yet to provide a stronger or more comprehensive solution that will likely involve a combination of (hugely dilutive) capital raises, offloading NPLs to foreign investors, along with some kind of “bail-in” steps for the Italian bank with the worst balance sheet, i.e. Banca Monte dei Paschi di Seana (BMPS). The publication of the 2016 EU-Wide Stress Test last Friday was intended to alleviate solvency concerns and to halt the vicious cycle of declining European bank stock prices that began early this year. 51 large European banks holding 70% of all European banking assets were covered. These banks were domiciled in the following countries: Austria, Belgium, Denmark, Finland, France, Germany, Hungary, Ireland, Italy, Netherlands, Norway, Poland, Spain, Sweden, and the UK. Banks in two of the Euro Zone’s most troubled economies, i.e. Greece and Portugal, were not included in the stress test. Key macroeconomic assumptions/projections of the 2016 stress test (see Figure 1 below) were similar in severity relative to those in the 2014 stress test. E.g. the 2014 stress test assesses a 3-year cumulative real GDP “shock” of -7.0% in the Euro Area, vs. a 3-year cumulative -7.1% shock in the 2016 stress test, as shown in Figure 1 below. The 2016 stress test, however, did refine its overall framework by adding two explicit assumptions relative to the 2014 stress test: 1) explicit bottom-up treatment of FX-related trading losses to entities in central and eastern Europe in the event of EM currency depreciation, and 2) cumulative losses of 71 billion euros driven by the concept of “conduct risk,” with 15 of the 51 banks tested having a conduct risk liability of more than one billion euros. Unfortunately, as I have asserted in my weekly global macro newsletters and my last two blog entries on the Italian banking system, what investors are looking for is not a “rubber stamp” approval by bank regulators on the integrity of European banks’ balance sheets or a halfhearted fund-raising effort by BMPS, but a strong, decisive, and system-wide capital-raising effort with government backing, along with a multi-year reform plan to rebuild the sustainability of long-term profits currently being impeded by: 1) prevalence of negative interest rates across much of the Euro-wide yield curve, 2) slow structural growth rates, especially within countries such as Italy, Portugal, and Greece, and 3) obsolete business models where certain business operations (e.g. trading) are being quickly replaced by hedge funds and fintech companies. The stress test did not include the impact of regulations that are likely to be implemented over the next several years. Known collectively as “Basel 4,” KPMG estimates that these would lead to an extra 350 billion euros of capital requirements for the world’s largest 100 banks. Bottom line: The publication of the EBA’s 2016 stress test results have failed to quell investors’ concerns of a systemic meltdown of the Italian banking system. Moreover, a successful recapitalization of BMPS is far from assured, as its capital raise is contingent on the sale of its 27.7 billion euro NPL portfolio, the latter of which will likely result in a larger-than-expected haircut on the Italian-wide 360 billion euros of NPLs. Continue to underweight European financials, especially Deutsche Bank and Italian banks in general. I last discussed the vulnerabilities in the Italian banking system in our April 12, 2016 blog post (“Strengthening the Global Banking System’s Weakest Link“), where I asserted that–given its global inter-connectivity today–the world’s financial system can only be as strong as its weakest link. Typically, a liquidity or solvency issue can linger on indefinitely, simply due to the absence of external shocks or because the overall global economy is doing well. In the case of the current NPL issues with the Italian banking system, an effort in January to encourage sales of NPLs by providing government-backed guarantees unfortunately attracted investors’ attention to Italian banks’ NPL issues. When we last covered this issue three months ago, Italian banking stocks were “only” down 20% YTD; today, they are collectively down by 55% YTD. The vulnerability of the Italian banking system–and by extension, that of the Western European banking system–has come under increased scrutiny over the last several months, exacerbated by: 1) the unexpected, ongoing deflationary malaise in much of the developed world; the May 2016 Italian inflation reading was -0.3% year-over-year, worse than market expectations of -0.2%. June 2016 Italian inflation is expected to hit -0.4% year-over-year, resulting in six straight months of deflationary readings, 2) the dramatic flattening and downshift of the Western European yield curve; globally, nearly US$12 trillion of government bonds now have negative yields, and 3) an unexpected vote for “Brexit,” equivalent to a negative growth shock within the EU, as well as heightened political and economic uncertainty. The Italian banking system in particular is saddled with 360 billion euros of NPLs, equivalent to about one-third of all of the Euro Zone’s NPLs. Moreover–as efforts since January have demonstrated–a concerted sales effort in NPLs in Europe is not a simple task. Firstly, EU rules explicitly ban the use of government-backed guarantees to cushion NPL losses. Secondly, the average restructuring period for Italian bad loans is an abnormally long 8 years; a quarter of cases take 12 years. Finally, the European market for NPLs is small and underdeveloped relative to the overall stock of NPLs in the banking system. In other words, the market for selling Italian NPLs is relatively small, and is almost non-existent without government-backed guarantees (e.g. A proposal by Apollo to purchase 3.5 billion euros of NPLs held by Italian bank Carige back in March made no progress). Italy’s NPL issues are especially concerning given the lack of core profitability of the Italian banking system (see Figure 1 below). It is generally agreed upon that an Italian government-led recapitalization of 40 billion euros into some of Italy’s largest banks (Unicredit, BMPS, and Intesa, for example) would be adequate to resolve the Italian NPL issue, as long as Euro area growth re-accelerates; at the very least, the immediate probability of a Euro-wide banking contagion would be reduced by an order of magnitude. There are two real obstacles to this “happy scenario,” however: 1) the EU, backed by Germany, is resistant to any Italian government-led efforts to recapitalize the banks at no cost to Italian bank debt holders, as this directly goes against EU rules. Any attempt to “bail-in” Italian banks would increase contagion risks among all of EU banks as both depositors and debt holders will likely take their capital and flee to either the U.S. or other safe haven asset classes, such as gold, and 2) Italian Prime Minster Matteo Renzi has promised to resign if he loses the constitutional referendum to be held in October. Recent opinion polls suggest Renzi’s campaign will fall short; this will likely lead to significant Italian and EU-wide instability given the surge of the populist Five Star Movement in recent opinion polls. Seen in this light, the fragility of the Italian banking system is an ongoing cause for concern. As I discussed in my most recent newsletter (please email me to request a copy) and in my February 19, 2016 Forbes column (“Shares Of Global Banks Are Too Cheap To Ignore“), I remain constructive on shares of U.S. financial companies, despite (or even because of) their recent underperformance. More specifically, I asserted that much of the current fears (e.g. impact of rising energy-related defaults and ongoing litigation costs & financial penalties related to conduct leading up to the 2008-09 global financial crisis) surrounding U.S. and global financial stocks are overblown. I also asserted that share prices of global financial companies in 2016 will mostly be driven by the Federal Reserve’s monetary policy, as a significant portion of U.S. banks’ revenues is driven by “net interest income,” i.e. the traditional role of banks’ borrowing short and lending long. In Wells Fargo’s case, net interest income makes up more than 50% of the firm’s revenue. If the Fed embarks on a renewed hiking campaign and the U.S. yield curve flattens, then U.S. banks’ margins will be hit, which in turn will depress their share prices. Fortunately, the U.S. yield curve is still very far away from flattening. E.g. As of this writing, the spread between the 10- and the 1-year Treasury rate stands at 1.27%. Just as important, the CME Fed Watch indicator does not suggest a rate hike until the FOMC’s December 21, 2016 meeting at the earliest. Moreover–despite the recent underperformance of U.S./global financial stocks–credit risk for the global financial sector remains relatively and historically low; in fact, as computed by S&P Global Market Intelligence, the implied credit risk within the global financial sector is actually the lowest out of all ten major S&P global sectors. As financial history and the experience of the 2008-09 global financial crisis have demonstrated, however, the global financial system is only as strong as its weakest links; and it is these “weakest links” that investors have recently focused on. More specifically, the slow pace of general and banking reforms within the Euro Zone, particularly the relatively high level of nonperforming loans in the Italian banking sector, is raising the specter of counter-party risks and resulting in a flight of capital away from Italian/European financial stocks (e.g. UniCredit is down 37% YTD, Intesa down 26%, and Banco Popolare down 38%), and to a lesser extent, U.S. financial stocks. The Italian banking system is saddled with about 360 billion euros of NPLs, making up about one-third of the Euro Zone’s total NPLs (although 50% of it has already been provisioned). With Italian banking stocks down nearly 20% YTD (and down 25% over the last 12 months), Italian policymakers are now being forced to act to shore up the country’s bank balance sheets through sales of NPLs, equity raises, and accelerating the write-off of NPLs. An effort in January to encourage sales of NPLs by providing government-backed guarantees gained little traction (and unfortunately attracted investors’ attention to Italian banks’ NPL problem), as Italian policymakers could not agree on how the plan would be implemented, especially in light of European rules that explicitly ban state aid to failing companies. So far this week, Italian policymakers–working in conjunction with banks, pension funds, and insurers–have drawn up plans for a 5 billion euro bailout fund (dubbed “Atlante”) to purchase NPLs and/or to inject capital into ailing banks. Investors’ initial responses have ranged from skeptical to condescending, given the relatively small size of the fund and the lack of details surrounding its implementation. Bottom line: Italian/European policymakers, in conjunction with the private sector, will need to work harder to create a more comprehensive and workable solution to reduce NPLs in the Italian banking system. Until this happens, the current rally in U.S./global financial stocks from their early February lows will remain precarious. Neoclassical economics cannot explain the spike in real global wealth per capita (nearly 10x) in the 20th century. The classic Cobb-Douglas Model attempts to explain global GDP growth through three major inputs: 1) “Total factor productivity,” 2) labor (L), and 3) capital (K). Both L and K can be quantified and explained. However, studies have shown that fully 70% to 80% of the increase in economic output during the 20th century came from “total factor productivity,” i.e. an exogenous factor that resembles technological growth and adoption—leading to increased overall productivity. Economists have a hard time explaining the origin of “total factor productivity.” We know that education (investment in human capital), venture capital, the capitalist system, and the sharing of ideas all play a role, but we do not truly understand why their benefits were unique to the 20th century (and to a lesser extent, the 19th century, when real global wealth per capita grew by 3x—please request a copy of our January 2013 newsletter for a more detailed analysis). What we do know is that the vast majority of global economic growth in the 20th century was predicated on an exponential increase in energy consumption. In other words, productivity growth—20th century’s main economic driver—was mostly a result of increasing energy consumption. Every technological breakthrough, such as modern-day jets, computers, fiber optics, automobiles, etc. required the consumption of increasing amounts of energy. In some areas, we have made efficiency breakthroughs (e.g. the shrinkage of CPUs), but in other areas, not so much (e.g. the internal combustion engine). Such growth is especially amazing given the mass human failures of the 20th century, such as World War I & II, the rise of communism and Nazism, as well as the Korean and Vietnamese Wars. More important: If the 21st century global economy is to grow in the same trajectory as that of the 20th century, global leaders will need to find cheaper and alternative sources of energy—horizontal drilling and fracking notwithstanding. 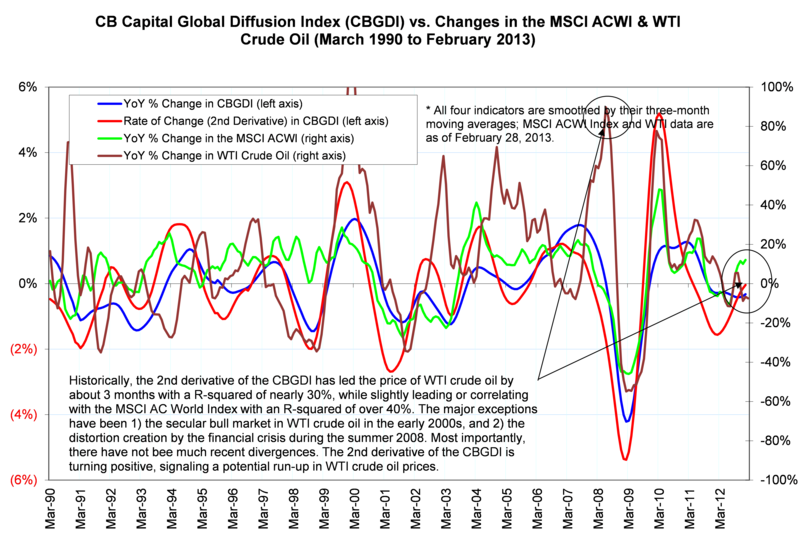 As noted on the above chart, the rate of change (second derivative) in the CBGDI (red line) has historically led the YoY% change in WTI crude oil prices by about three months. The major exceptions have been 1) the relentless rise in WTI crude oil prices earlier last decade (as supply issues came to the forefront), and 2) the explosion of WTI crude oil prices during the summer of 2008, as commodity index funds became very popular and as balance sheet/funding constraints prevented producers from hedging their production. The second derivative of the CBGDI troughed at the end of 2011, and has continued to rise—implying higher global stock and energy prices. While we recognize that U.S. crude oil production is set to rise by 1.4 million bbl/day over the next two years (not a trivial amount, as 1.4 million bbl/day is equivalent to total Indonesian oil consumption), recent strength in the CBGDI suggests that WTI crude oil prices have at least bottomed, for now. More important–unless celllulosic ethanol or second-generation biofuels are commercialized in the next several years (or unless room-temperature superconductors are discovered tomorrow)–this suggests that the secular bull market in oil prices is not over. As we are finalizing this commentary, we understand that Cyprus may be experiencing a bank run, as the EU had suggested taxing bank deposits to pay for the country’s bailout. If implemented, this will set a very bad precedent and will have long-term (adverse) repercussions in the European banking system. Such a Black Swan scenario may weaken commodity and energy prices in the short-run, but we believe WTI crude oil is a “buy” on any further price weakness. This is all random noise, and ultimately a waste of time. It doesn’t matter what you or I think. It only matters what Fed Chairman Bernanke, the ECB, IMF, Angela Merkel, and the new Chinese government think. Unless you are Bill Gross or Larry Fink and have a direct line to Treasury, I won’t care about what you have to say unless you are better at getting inside their heads–as well as the heads of large institutional investors–than I am. If you failed to time the last two major peaks of the global stock market (i.e. early 2000 and late 2007), then you have failed your clients–and should get and stay out of the investment industry. To gauge the sentiment of global policy makers and large financial institutions, you need to at least read Bernanke’s two major publications (“Inflation Targeting” and “Essays on the Great Depression”) and to get inside his head regarding what the Fed will do today. If you had read both books before the late 2007 to early 2009 crisis (which we did), you’d have had a much better idea on Bernanke’s next steps on a real-time basis during and after the financial crisis. It is unacceptable to be learning and reading about things after the fact. It is also unacceptable to write a long commentary when one could be brief. So here goes. A currency regime is only sustainable if the underlying currency is allowed to be debased on a small and consistent basis. It is laughable to hear young Americans advocating for the return of the Gold Standard, when these same Americans (especially the so-called Jeffersonian “yeomen farmers”) were advocating for a bimetallic standard and rallying behind William Jennings Bryan’s “Cross of Gold” speech in 1896. It also did not occur to these same individuals that a true gold standard never existed in the United States. Chaos reigned after President Andrew Jackson killed the Second Bank of the United States. Banks issued their own bank notes and inflated the economy through the normal credit cycle, in spite of the so-called gold standard. The “gold standard” subsequently became a strait jacket on credit creation once the down cycle hits–thus accentuating the busts. For example, at the peak of the Panic of 1873, the NYSE closed for 10 days, and 36% of all corporate bonds defaulted from 1873 to 1876. The latest financial crisis pales in comparison. With regards to U.S. interest/Treasury rates, we also know that there exists a shortage of global risk-free assets. According to numerous studies, there will at least be a shortage of $9 trillion worth of risk-free assets in the next five years due to the destruction of risk-free assets during the European sovereign debt crisis; as well as the implementation of Base III requiring higher capital standards of global banks. That means there will be a rush to purchase more US Treasuries, no matter where US domestic inflation lies. By the way, there is no hard rule that nominal interest rates have to track inflation; nor any hard rule that nominal interest rates have to be positive. In fact, my base case scenario is for the U.S. Treasury Bill rate to decline below 0% sometime in the next several years. Besides, we also know that inflation is nowhere near as “sticky” as it was in the last inflationary cycle during the late 1970s (culiminating in the peak of the gold price at $850 in January 1980). A comparison to the late 1970s to 1980 is thus erroneous. Inflation was very sticky in the 1970s given the rigidity of wage increases due to the power of unions and the fact that US labor was mostly domestic in nature. Today, unions no longer hold any power; and US labor wages are tied to global wages due to outsourcing. So in a nutshell, yes, the Fed will continue to ease. And no, the government will not spend less; nor will it increase taxes. And yes, interest rates will remain low until at least the next Presidential election. And yes, what you say does not really concern me, unless you happened to be in a “Top 50 list” of global policymakers or a fund manager with >$100 billion in AUM. And at the end of the day, it doesn’t matter whether you agree or disagree with these global policies. As an investor, my concern is only about making money for my clients. And outside of that, my time could be better spent with family and friends rather than discussing the questionable virtues of a “sound currency” or “sound policy”–whatever that means. While today’s 20- and 30-something investors cannot conceive of a Greek or any sovereign default, it is actually a quite common occurrence (Argentina was the last major country to default in January 2002). A partial default and devaluation becomes immensely attractive as the costs of default (e.g. domestic investor losses, a higher yield premium as the country borrows again, etc.) declines relative to the costs to sustain payments of a ballooning debt. A recent Richmond Fed paper (2007) (“The Economics of Sovereign Defaults”) shows that based on empirical evidence, sovereign defaults are very common throughout history. Spain defaulted six times between 1550 and 1650, while France defaulted eight times between 1550 and 1800. 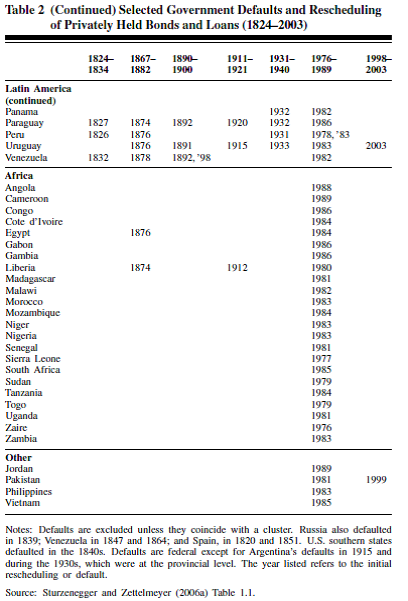 Between 1820 and 2004, there were 250 sovereign defaults by 106 countries. 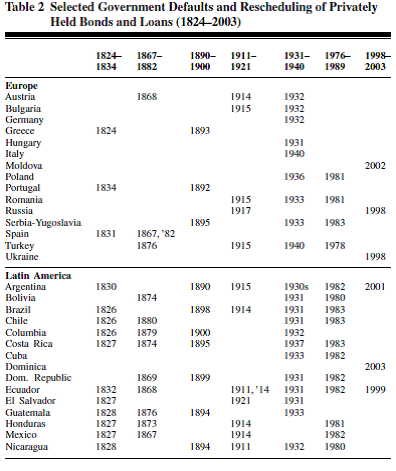 The following table shows a list of sovereign defaults from 1824 to 2003 grouped into seven temporal clusters. More important, the Richmond Fed paper also suggests that the costs of default have actually declined over the last century, given the rising competition to supply sovereign capital between international creditors. For example, in the 19th century, international lending was dominated by a few major lenders, such as Rothschild, Barings, Schroders, and Morgan. These banks can threaten to shut out borrowing countries in the future if they defaulted. Today, international lenders can no longer do so, given the huge variety of potential lenders, such as hedge funds, private equity funds, sovereign wealth funds, fixed income mutual funds, and even ultra-high net worth individuals. In other words, there will come a point (likely next year) when it becomes highly attractive for Greece to default, assuming the ECB does not step in with a more aggressive QE package or a regional banking union. The lack of fear in the market (as indicated by the relatively low VIX reading of 17.06) is also concerning from a bull’s standpoint. The global financial system–and the global economy–looked much brighter today than it did yesterday after the European Central Bank decided to (finally) implement a mechanism (the OMT, or the Outright Monetary Transactions program) to provide support to the Euro Zone’s peripheral countries. Essentially, the ECB has declared that it will potentially purchase an unlimited amount of the peripheral countries’ short-term government bonds (up to a three-year maturity). With the Euro Zone’s core countries such as Germany and France on the verge of a recession, such support makes political and economic sense, especially with Spain’s 25% unemployment rate amid ongoing rumors of significant capital flight. In response, the Dow Industrials jumped 1.87%; the S&P 500 2.04%; and the NASDAQ Composite 2.17%. Surprisingly, gold only rose slightly, by 0.4%, while WTI crude oil actually declined by 0.1%. The ECB’s latest action is more than an incremental step. In essence, the ECB is monetizing much of the Euro Zone’s peripheral debt, which runs counter to the original intent of policymakers when they created the Euro in 1999. The ECB’s latest action cannot be justified unless there is a promise of fiscal integration in the future. This is the direction I see the Euro Zone heading. This has been the dream of European policymakers since the end of WWII. They are getting what they had always wanted, although not in the way they envisioned. Either way, the ECB’s latest resolve puts a floor on risky assets across the globe (a form of the “Draghi Put,” if you will), especially bank and consumer stocks in Europe. Contingent on the U.S. “fiscal cliff” being resolved after the U.S. Presidential Election (Intrade puts the chance of an Obama win at 58%), I am pretty optimistic on U.S. economic prospects in 2013, and beyond.